Faith actually got out of bed yesterday and said, “Today’s a big day – a field trip and my test to see if I can move up in gymnastics.” Faith is a very determined little girl, when she wants to be. If she wants to accomplish something she will try and try and try until she gets it right. She did that with roller skating and she did it again with gymnastics. She realized a week ago that if she could get her ‘bridge kick over’ then she would be able to move up to the next level in gymnastics. She practiced everyday for a week. By the time she went to class she had it down pat. At the end of class her instructor came over and told me that they wanted to invite Faith to join the Level 1 Pre-Team. It would meet twice a week for an hour and half. I had no idea that she was going to jump ahead two classes. She and I were both very exited and proud. We are now trying to determine if that is the right move or not for Faith. Faith wants to try it so I think we are going to let her. If it gets too daunting then she can always go back down a level. Right after gymnastics we headed over to the soccer field for Wilson’s game. He has come a long way in the last year. He is an aggressive player and has some skill. The big play of the night was wilson getting his first soccer goal. He was so excited, as were we all. In honor of Faith and Wilson’s successes, we went to get ice cream at 7:00pm. This was dinner. I may be super rigid about the food I bring into the house, but I am not afraid to feed my kids ice cream for dinner. Way to go Faith and Wilson! This entry was posted in Uncategorized on April 25, 2015 by Becca. A few months ago, Doug sent me a text saying that his 40th birthday was drawing near and that he was going to have a party. He casually invited me to come up to celebrate with him. Immediately I checked on the cost of flights from Charlotte to Baltimore. They were only $187 per ticket – a deal. So……I bought two of them right then and there. This is highly uncharacteristic of me, but it sounded like fun and I didn’t want to miss Doug’s 40th birthday celebration. You only turn forty once. Tom and I arranged childcare for the weekend (which means that my parents and Sidney did most of it) and off we flew to Baltimore. Tom had already been gone all week for business so he ended up flying back into Charlotte on Friday morning, waited in the airport all day, and then flew to Baltimore with me that afternoon. It was great to see Doug, Jacqueline and the kids again. I think the most surprising part of the trip was the excitement that Gabriel and Shepherd showed at my arrival. They poked their heads in my room early each morning to see if I was awake yet and asked me to and play with them. We spent Saturday morning playing in the backyard and taking silly pictures like this one…..
On Sunday we went for a nice leisurely hike along the river. Gabriel kept coming over and holding my hand while we walked. It was very sweet. I love my little nephews and I am very glad that we are building a relationship – especially now that they live further away. The big night out was Saturday night, which was Doug’s actual birthday. We went out to dinner with another couple from Doug’s work (Andrew and Claire) and my good friend, Todd Johnson, from high school and youth group. I have only seen Todd once in the last 24 years so I was very excited to get to see him and his new wife. I kept saying that I wanted to get a picture of all of us, but it never actually happened….we were too busy having fun. Oh well, maybe next time. I did get one picture of Doug on his birthday -it was during his birthday serenade by the mariache band, complete with a sombrero. Doug and I have been close for so many years (all of our lives) that it just seemed fitting that I would be there to celebrate his 40th birthday. I am so glad that we went. Happy birthday Doug!! This entry was posted in Uncategorized and tagged 40, baltimore, doug, Ellicot city on April 24, 2015 by Becca. We have had quite a week. I decided months ago that we were going to have a fun filled stay-cation over spring break. We typically don’t go anywhere for spring break, but that doesn’t mean that we couldn’t still have lots of fun in Charlotte. I planned for us to do something new and different each day of the week. On Monday, Tom took off from work and we went to one our families favorite places – The Lazy Five Ranch. I scheduled a wagon ride for the morning so that we could feed all of the animals first and play on the playground afterwards. Last year the wagon ride was very exciting, but this year the animals were not really coming up to the wagon like they had done in the past. Unfortunately, Faith is terrified of almost all animals so the wagon ride was a bit traumatic for her this year. I don’t remember her being scared last year, but this year she cried as soon as the first animal came up to the wagon. If we go again, we will feed the sheep and goats behind the fence first so that she will warm up to the animals before we stick her on an open wagon that is swarming with giant cattle, zebras, and emus. By the end of the ride she had grown a bit more comfortable. After the wagon ride we ate lunch, played on the playground, fed camels, goats and sheep through the fence, and ate ice cream. 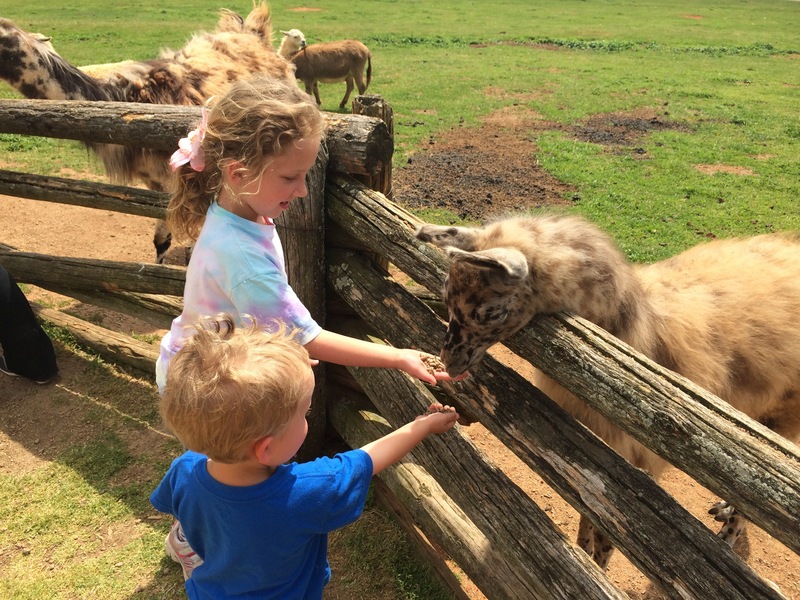 Here is Faith after the wagon ride feeding a llama. I had to take a pictures because I was so surprised that she was actually doing it…. It was almost time to leave when I had a great idea – if I do say so myself. Since we had already paid for admittance to the park, I realized that we could drive through the park in our car before we left. The car ride through the park ended up being the highlight of our trip! Here we are entering the park – everyone unbuckled and in the front two seats…. It didn’t take long before Faith and Miller were in the back seat of the car hiding from a giant animal that was sticking his head through the open car window looking for food. It was hilarious! Wilson drove most of the way through the park while sitting on Tom’s lap. 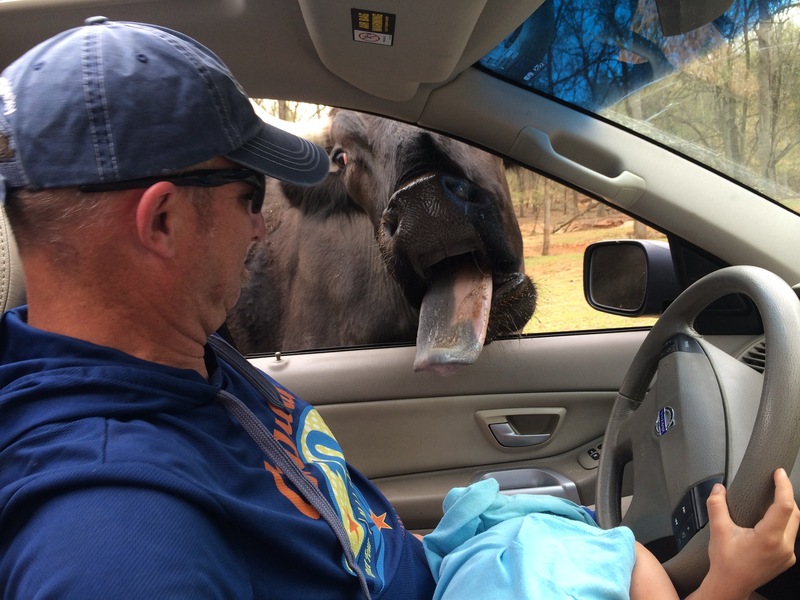 I think Tom got a big wet kiss from this guy…..
Our trip to Lazy Five will be talked about for the next year! As for the rest of the week, on Wednesday we went to Monkey Joe’s with Faith’s friend, Jane, and her siblings. I ended up bringing one of the neighborhood boys with us as well. The more the merrier! 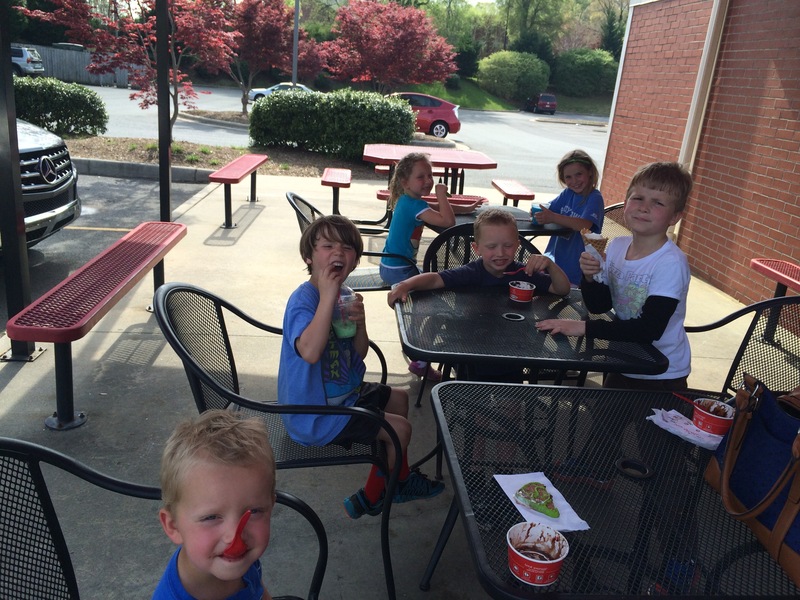 Here are all the kids eating ice cream after we left Monkey Joe’s. Note to self: do not go to Monkey Joe’s on half-price Wednesday during Spring Break. On Thursday we went to Ray’s Splash Planet with my friend, Erin, and her two kids. Of course, it was crowded also, but the kids didn’t seem to notice or to mind. They swam for a few hours and then we headed outside for a picnic. The picnic was my favorite part, mainly because it was quiet. On Friday, I literally filled up my minivan with children and took them to ISC (where Faith takes gymnastics) to the open gym that they were having that morning. This was the first thing that we did that wasn’t crowded. I will go to open gym twice next year. It is only $15 per kid and they get to play for three hours on all of the gymnastics equipment. I was going to take only one extra kid with me, but when I showed up at Ronnie’s house to pick him up there was another neighborhood boy there. I decided to invite him as well. We found his dad, got some money, and threw him into the car with everyone else. Spring Break was a success! I loved having the kids at home with me. I loved not having to get up in the morning and go to work. I loved being able to have some fun and spend time with our family. After this week of freedom, I am REALLY looking forward to summer break. Only six more weeks until we get to do these things all of the time! I am counting down the days…. This entry was posted in Uncategorized and tagged lazy five, pool, spring break, stay cation on April 14, 2015 by Becca. Because there is so much to do around here, we realized that it was going to take us until Christmas to get everything done, not to mention a lot of work, mess, and stress. We decided to hire a handy man named Bruce. Bruce is giving me my life back. Hiring him is the best thing that we have done in a while. He was able to finish the entire downstairs ceilings and install the vanity in one week. He is worth every penny! As for the outside of the house, we have been trimming trees and emptying the back gully which was full of branches and shrubs that we didn’t want to deal with over the past seven years…it turns out that we couldn’t avoid them forever. Yesterday we had Erik, our neighbor, over here with his chainsaw cutting up the makeshift bridge that we had made with the railroad ties that were left from the people that lived here before us. We drug a lot of it out to the street but there was no way that we would be able to get the rest of it out there. Erik and Tom had a brilliant idea – have a big campfire in the backyard and burn all of the remaining wood and debris. Brilliant! They built a rim around the fire pit with all of the random pieces of concrete laying around. It turned into a neighborhood project that everyone could enjoy. Over the next three days we burned up all of the dead branches and railroad ties. It was a lot of fun. We roasted marshmallows and played outside until after dark. We worked very hard to clear out the backyard, but it looks amazing. We may even keep the fire pit there so that we can use it again. Our house is going to look so good that we won’t want to leave. This entry was posted in Uncategorized and tagged fire, house, work on April 5, 2015 by Becca. Easter is always a fun holiday filled with egg hunts and sunrise services. This year the kids had two egg hunts – one in the neighborhood and one at church. Egg hunts are fun for the kids but I hate that the eggs are filled with candy. You know that I am a health nut and to give my kids twenty pieces of candy on two occasions is almost too much for me to bear. After the first egg hunt I let them eat a bunch of it and then told them that I would take then to the dollar store if they gave me the rest of their candy. Of course, I took a bunch of it when they weren’t looking – just in case they didn’t want to give it up. For the second egg hunt, which was at the church, I let them eat a good ten pieces before I offered to buy them ice cream if they gave up the rest of their candy. They did it. I know it sounds silly to give ice cream in lieu of candy, but let me explain. I can give them ice cream and then be done with it – no more begging for candy and no more arguing with them about whether or not they can eat five pieces right before dinner. Done! Here they are at the church going through their loot. And here they are playing with said goods while I danced during my cardio funk class that was outside at the Prominade. I couldn’t have planned it better. Tomorrow we will be getting up early to go to the sunrise service. We will be celebrating Jesus’ rising from the dead and the sacrifice that He made for us on the cross. Without Easter, Christmas would be meaningless and Jesus would just be a normal man. But we do have Easter, we do know that Jesus is God’s Son, and we do have new life because of what Jesus did for us. I thank God every day for His Son and the love that He has for us, and the love that we have for Him. This entry was posted in Uncategorized and tagged Easter on April 4, 2015 by Becca. As you know, when it comes to which school the kids attend next year we have many options to choose from, sort of. There are many options but not all of them have worked out. The options have become more and more narrow as the weeks have gone on. First, the kids did not get into Union Academy, which is a charter school in town. Then, they both were offered a spot at Metrolina Christian Academy. I had applied here during my short, but very real panic attack back around Valentine’s Day. I freaked out because I realized that they may not be going to a Christian school, which is what I love most about Faith’s school now. The woman from Metrolina called me one Tuesday and said that I had four days to decide whether or not I wanted to enroll them for next year or else the spots were going to go to the next child on the wait list. (We had already bumped Wilson down a spot once before because we didn’t want to commit.) I had to decide whether or not to spend the deposit money to enroll the kids at Metrolina when I didn’t know if we were going to move into a good school district or not. I am usually able to hear fairly clearly what God wants me to do in life. I have no trouble knowing what He is telling me what to do each day, where to work, if we should move, etc. This decision, however, stumped me. There were so many factors: money, religion, us moving, us selling our house, public school districts, leaving CDS, etc. I had a really hard time separating out all of the many factors that were contributing to my indecision. I think I cried for a majority of morning that Thursday, which was my last day of decision making. I felt like I was determining the rest of their lives with this one decision. I had to tell Metrolina by 3:00pm whether my children would be going there or not. I prayed that God would make it “abundantly clear” what my decision should be. Even at the end of the day, I was still unclear, and I still am, somewhat. I continue to wonder – Did God tell me months ago to “wait”, but I didn’t and now I have caused all of this strife in my life by not waiting? I will never know. What I do know is that I was emotional about this decision for many, many reasons. Probably the biggest reason is that I am a mom and I want the very best for my kids – just like every other mom on the planet. 1- I cried every time that I thought about them going to a non-Christian school. This is not because I thought that they would be miserable or mistreated at a public school, but because I love the community of the Christian school, I love that the teachers pray for their students, and I love they look at each student as a child of God with different strengths, talents and weaknesses. 3- My mom went with me to the school to tour it one more time. I was going to go alone, but since I was such a basket case of emotions I thought it would be best to bring someone along with me. I value my mom’s opinion on just about everything (especially on Godly and financial matters) and knew that if she left thinking it was a good school then it must be one. The tour was given by a woman named Monique who was so sweet and kind. She knew my struggle to make the decision and empathized with me. At the end of the tour she held our hands and prayed for me, my children and my decision. Later that afternoon, my mom said that they should be going to Metrolina because it is important to send them to a Christian school during their formative years. Coming from my mother, and my accountant, that was a big vote of confidence that we would be making a good decision both financially and spiritually for our family. 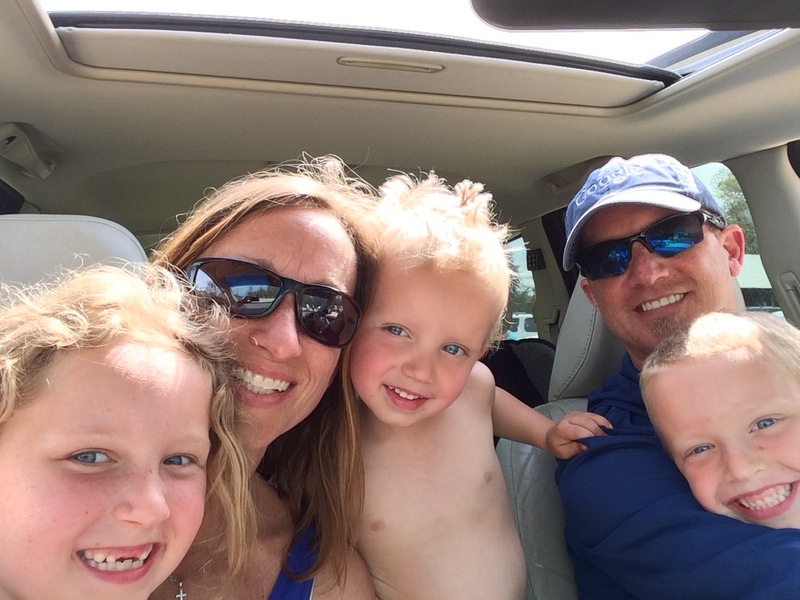 4 – I didn’t want to leave it all up to us moving and being able to change school districts. (Maybe lack of faith on my part, but no one likes the unknown.) I didn’t know where we were going to move or even if we were going to move to a new house this summer. I didn’t want to send them to the school that we are currently zoned for due to the school’s late hours. I wish that there was a school that had only a 4-5 hour day. That would be perfect! I would love to homeschool, but I know that I wouldn’t be very good at it. The day would end with me saying, “Oops, we didn’t get to our work again today. Oh well. Maybe tomorrow.” I have a vision of what a homeschool mom and family are, and we are not it – well organized activities, maps on the wall, a flourishing garden, well attentive children, etc…..not us! In the end, all of these things added up to help make my decision clearer than it was that morning. We decided that we would enroll Faith and Wilson into Metrolina Christian Academy. As the weeks have passed, I am feeling more and more comfortable with our decision. Faith and Wilson both know that they will be going to this school in the fall and are excited to be together. The bottom line is this: God is in control of ALL things. I have to have enough faith to trust that God is going to provide the money for the upcoming year(s) of private school. I need to trust that He will take care of my kids no matter where we live or where they go to school. Even if we change our minds this summer after we move, I know that my children will be taken care of and that they will learn to know and trust God in their day to day lives. I am thankful that we have the ability to make this type of decision. Never in a million years did I think that this would be something that would be an option for our family. I know that we are very blessed….no matter where we end up. This entry was posted in Uncategorized and tagged decsion, Faith, metrolina, school, wilson on April 1, 2015 by Becca.